Are you new to the Olympia area? Learn about Tumwater Falls Park, a classic in-town stroll where you can admire waterfalls on the Deschutes River. Tumwater Falls is a small historical park set in the midst of two bustling city centers. The falls, as it is locally known, is a great in-town walk anytime of the year. This means that even in the worst weather, you can still enjoy the falls and the park. "Tumwater" is the Chinook word for waterfall. The falls are 82 feet in height and features two prominent drops, one of which is 25 feet long. The waterfall is located at the mouth of the Deschutes River where it joins the lake leading out to Puget Sound. The park and grounds are free and open to the public from 8am-4:30pm. 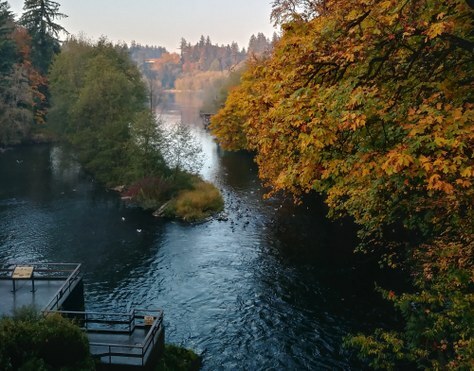 The falls are located on the bank of the Deschutes River and notably feature views of the now-defunct Olympia Brewing Company, which can be seen from the bridge overlooking the falls. The lower park takes you past two significant local homes: Crosby (known as the Bing Crosby ancestral home) and the Bigelow House. The Bigelows were important pioneers in early Washington history and the complicated struggles for public education and women's rights. These historic homes are definitely worth a visit before or after your visit to the park. The hike is considered easy, but be prepared as some surfaces are uneven and slick due to water spray coming from the falls. Leashed dogs are okay, but please come prepared with dog bags.